(ABOVE) How fun that blush (“Rose Quartz”, this year) is back in style, because I love, love soft pink! I’ve had this blush shirt for five or more years (see the current version here), and recently bought this dark pink bag (Antique Rouge) and patent-bow slingback flats. If you saw my last post, it was a vlog of my visit to Talbots, Ann Taylor, and J. Crew to peek at the new springwear in stores right now. 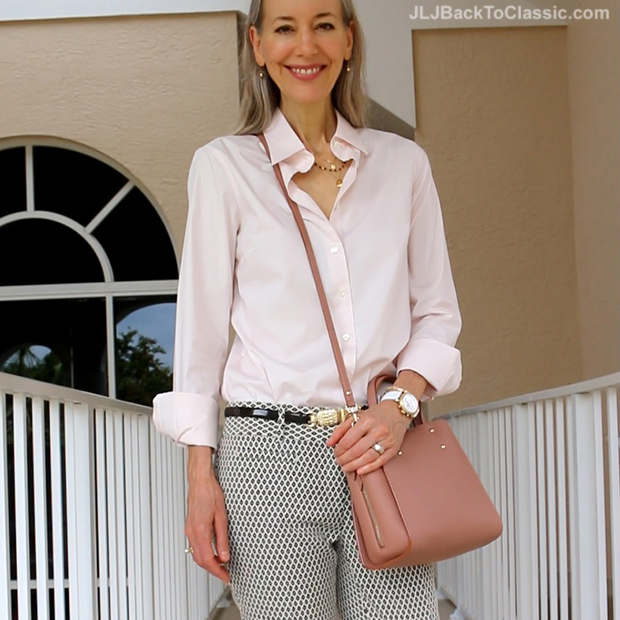 I ended up getting a few items, three of which I’m wearing in this post–the shoes, bag, and pants, all of which are from Ann Taylor. The shoes and bag both are versions of the season’s top color hue, “Rose Quartz”. I love that they aren’t the same material, texture or color, but that they go together beautifully. It’s much more interesting that way. The pants are a cropped jacquard print that are just slim enough through the hips and thighs to show off the curves but are still loose enough to be comfortable and cool when the weather starts getting hotter. (ABOVE) My bag and shoes are from Ann Taylor; and so are the jacquard pants. (ABOVE) This crossbody tote is faux leather, and therefore lightweight on the shoulder. My Michele Diamond CSX Watch is about 12 years old. 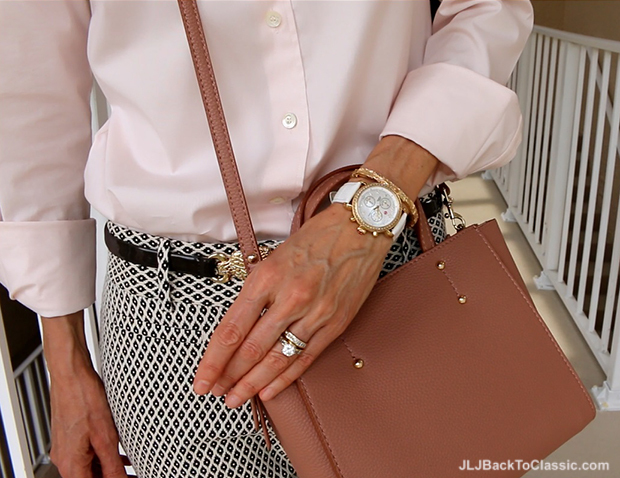 (See similar Michele watches here and at Neiman Marcus). (ABOVE) I’m wearing Nourish Organic Shea Butter on my lips with Gabriel lipstick in the color clay smoothed over it. 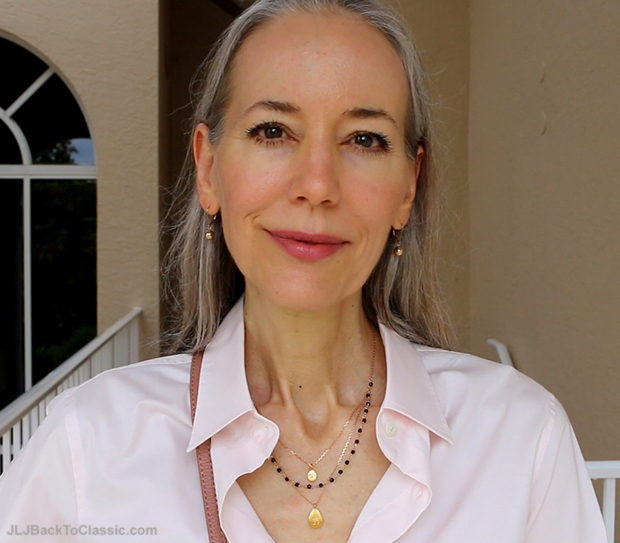 My necklace is by Satya (see alternative on sale here). See similar earrings here. 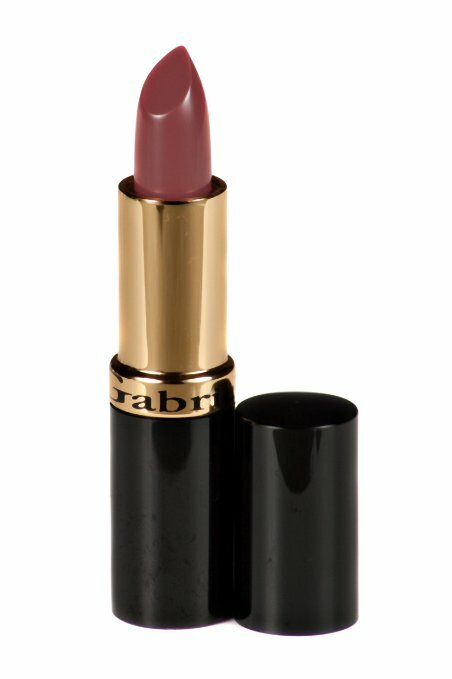 (ABOVE) On my lips, Gabriel lipstick in the color clay. Gabriel cosmetics are all natural and vegan, and are cruelty free. Oh so cool,you re so smart alwayss janis.happy days. Thanks for showing the Gabriel lipcolor in Clay. I ordered it online and really like it! You are absolutely smart lady,you re older than me but you look super nice and smart person,thats important.I wish we lived next door to each other,we would have such a blast togather,much loves and huges lady janis.See ya. youre very wellcome,we can talk details on word game lol if you download.Happy days. where is your pants from so lovely,what did you do today? This is one of my best bracelet lovely Janis,do you like it? I loved everything you got cute pieces. Please do some fashion haul video on camera in your house,cause of clothes materials looks much better on camera.